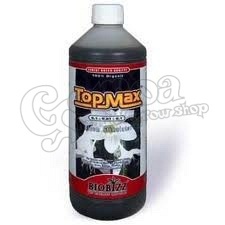 Topmax is a 100% organic flowering enhancer. Using Top·Max™ can help your garden with three important tasks. First, the nutrients in Top·Max™ can help increase the actual size and weight of clusters of flowers. Second, plants grown with Top·Max™ have a sweet, smooth taste in the finished product. Third, using Top·Max™ can help increase your plants uptake of nutrients. Top·Max™ is designed especially for use in combination with Biobizz® substrate mixtures. Sometimes the nutrients in soils are not readily available to plants. The humic acid in Top·Max™ can help change this, increasing the availability of vital nutrients to your garden. Our humic acid comes from a material called Leonardite, ancient vegetation converted into a rich source of humic acid over millions of years. When this ancient plant life died, it was buried deep in the earth and processed by time and pressure into a soft rock-like material rich in concentrated humic acid. Humic acid can interact with the nutrients in your growing media, increasing the availability of nutrients to support actively growing plants.